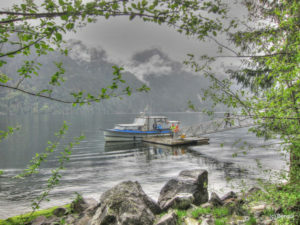 Join your fellow Nature Vancouver friends for a 5 hour boat tour of Indian Arm, viewing wildlife, First Nations Pictographs, Silver Falls, Buntzen Power Stations, Thwaytes Landing, Wigwam Inn and Granite Falls. We will rendezvous at the Cates Park (Dollarton Hwy) Dock at 9:30 am and board the Oceanwatch 11 vessel, owned and operated by Indian Arm Recreational Services. There is a washroom on board. We are welcome to bring our lunch on board; there are no food or beverages on board to purchase. We are expected to return to Cates Park at 2:30 pm. The trip is rain or shine unless our captain decides to cancel due to inclement weather or rough water. If it is cancelled, we will reschedule. Registration is limited to 38 (thirty eight) participants and deadline is June 28. To register or for further information contact Bengül by email (bengul_kurtar@yahoo.com). Registration will be confirmed upon receipt of payment – $40 cheque made out to Nature Vancouver and mailed to Bengül. We will pass the hat at the end of the trip for a small gratuity for the crew. Please bring full rain gear, sunglasses, (depending on weather on that day) extra warm clothing, hat and gloves. Bring your lunch, snack, water, binoculars, your camera and a sense of adventure! No cancellations 48 hours prior to the trip.